From day one of launching the Paperform platform, we've been all about enabling you to create beautiful web forms that not only represent your brand, but get stuff done. These days getting stuff done means having some seriously good automation in place. 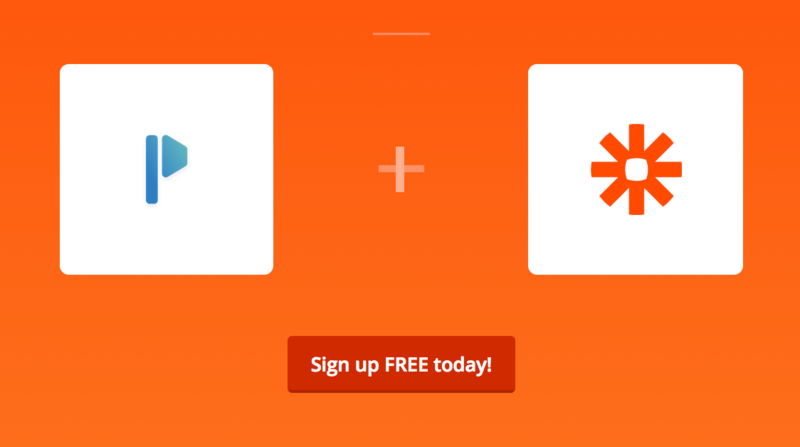 So, we're happy to announce that after several months of Private Beta we're going Public on Zapier! 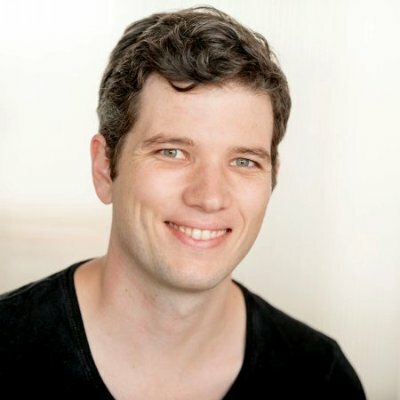 For those of you that have been living under a rock, Zapier is an amazing service that takes all of the code out of connecting your apps and setting up workflows. With over 750 apps to choose from, chances are, if you need it, it's already there waiting for you to connect. But what's going public mean? 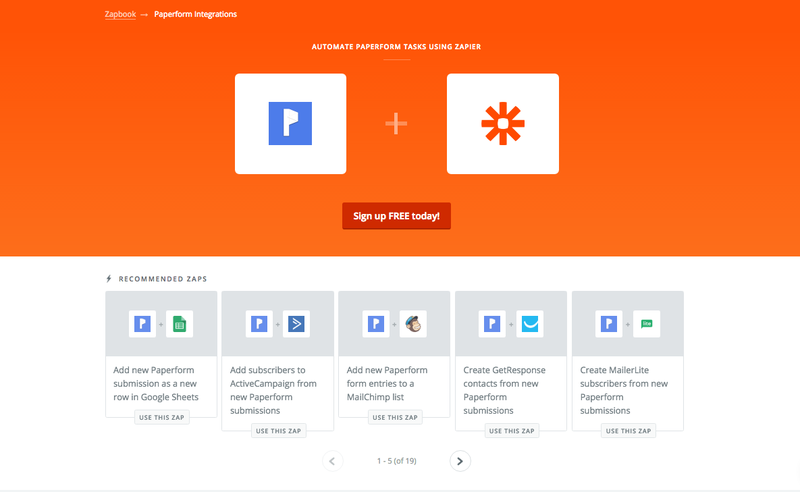 First of all, anyone on Zapier can now find the Paperform platform and create their own integrations with any of the other (hundreds of available) services. Paperform also gets it's own special page at zapier.com/zapbook/paperform where you can browse a whole bunch of pre-built Zap templates. With a public app, we can also continue to create more and more Zap templates, to reduce the amount of work our users need to put in to integrate existing services. This means it's now easier than ever to add a row to a Google Sheet when your forms are submitted or subscribe that lead to a MailChimp list. To make life even better, we've pulled the most popular zaps right into Paperform forms as embedded zaps. If you take a peak under Configure > Submission Behaviour on any of your forms you'll see the most popular services that we integrate with, so that you can kickstart those integrations with Zapier in seconds, and without even having to leave site. Lots of Paperform users have already jumped in and got their hands dirty with Zapier, check out this user's experience for a deep dive on setting up Zapier with Paperform and Trello. What are you waiting for? 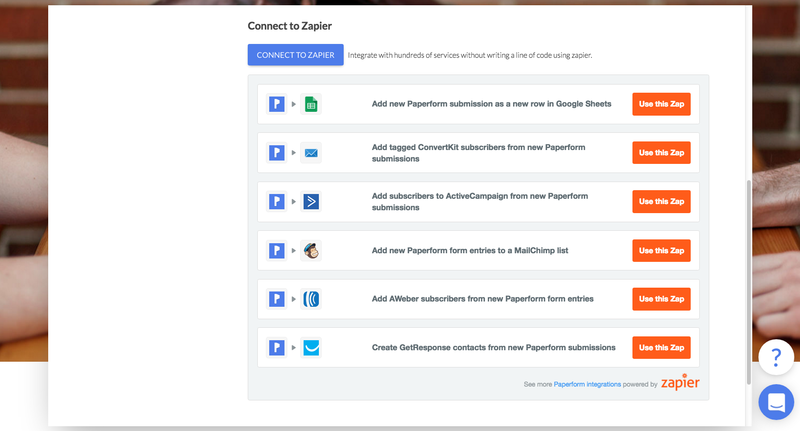 Get productive now with Paperform and Zapier now.